Despite writing a film and television blog that focuses heavily on the awards season, I rarely pay much attention to the Emmy Awards. There are a number of possible reasons for this: I’ve never seen most of the nominated shows; It’s timing doesn’t coincide with the rest of awards season, and thus just doesn’t feel right; Just plain apathy. Pick any reason, and there’ll probably a little truth to it. So I didn’t watch the Emmys last night. But they went on nevertheless. And unlike Dr. Schrödinger’s eponymous kitty, their outcome was unaffected by my observation, or lack thereof. Looking back on the night, the big surprise turned out to be Breaking Bad beating out True Detective in every category except directing. But is it that much of a surprise, really? Yes, True Detective is one of the absolute greatest things I’ve ever seen on television, and Matthew McConaughey and Woody Harrelson were revelatory and every bit deserving of recognition for their work. And yes, most pundits expected them – or at least McConaughey and the show itself – to get that recognition. 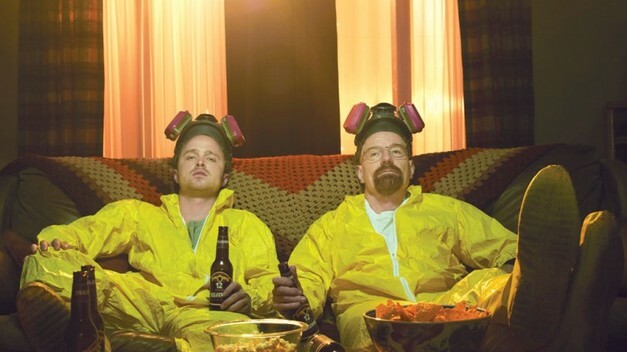 On the other hand, not only is Breaking Bad also one of the greatest TV shows ever made, it’s also being rewarded for it’s outstanding final season. (Personally, I’ve got about 6 episodes left to go, as of writing this.) Honestly I don’t know how you DON’T recognize that. It’s kind of like the final Lord of the Rings sweeping up every award it was nominated for at the Oscars.